There is no scientific basis for the common misconception that you shouldn't cook with extra virgin olive oil. Many of the myths around cooking with olive oil have to do with smoke point. Many people mistakenly believe that you should only cook with oils that have a high smoke point. The smoke point of an oil is defined as the temperature at which the fat produces a thin, continuous stream of bluish smoke under controlled circumstances. Although it had been assumed that smoke point indicated an oil’s safety and suitability for cooking, new research has shown that is not the case. An oil’s smoke point does not correlate to its performance and stability when heated. Rather, the factors that predict an oil's safety and stability at high heat are the percentage of polyunsaturated fats (the lower the better), and the extent to which the oil has been refined (the less the better). Extra virgin olive oil, which has a low concentration of polyunsaturated fat, and is not refined at all, proved the best oil for cooking. Extra virgin olive oil was the best performing oil but regular olive oil also performed better than most seed oils. According to Leandro Ravetti, one of the researchers in the study, this is because of three reasons: 1) the oleic acid composition of olive oils; 2) the fact that regular olive oil is enriched with some (usually around 15-20%) unrefined virgin olive oil; and 3) the fact that the refining process for olive oil is done under relatively gentle physical conditions compared to that used for seed oils which are extracted with solvents and therefore need to be aggressively refined at very high heat. The below infographic explains how the study was conducted and its conclusions. In conclusion, if you love olive oil, now you can confidently cook with it--even extra virgin olive oil--as you would any other oil. A recently published research paper assessed the most common supermarket cooking oils, and determined which is the most suitable for use when cooking. WHAT HAPPENS WHEN YOU HEAT COOKING OILS? Chemical changes (e.g. oxidation, hydrolysis) – this can lead to the production of potentially harmful compounds (e.g. polar compounds) that are linked with negative health outcomes. 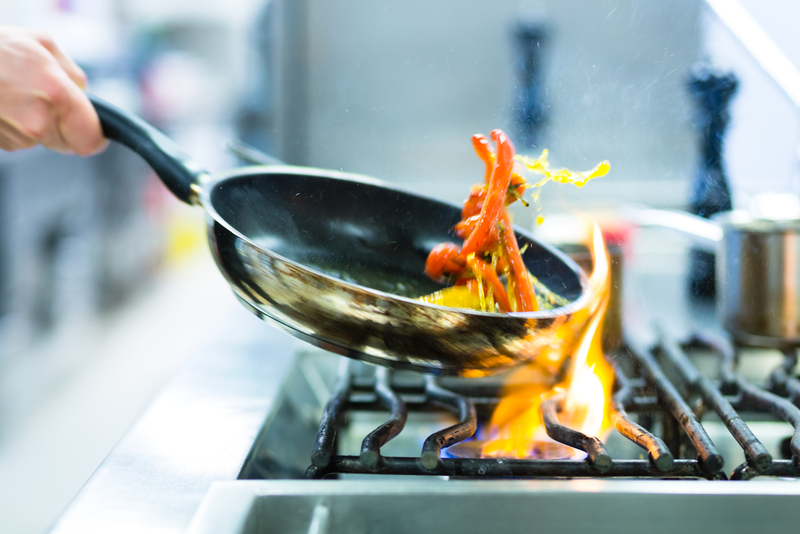 Commercial kitchens regularly assess the levels of polar compounds in cooking oil - on average, 25% of polar compounds is the limit to ensure the oil is safe for continued use. Physical changes (e.g. thickens, foams). Oils heated gradually (over 20 minutes) from 25 to 240ºC / 77–464ºF. Oils heated at 180ºC / 356ºF for 6 hours. EVOO was the most stable oil of those tested – in both tests, EVOO yielded lower levels of polar compounds and trans fats when compared with other oils – Canola oil, Grapeseed Oil and Rice Bran Oil performed the worst and produced very high levels of polar compounds and trans fats. This shows that EVOO is the safest and most stable oil to cook with. This research showed that cooking oil smoke point is NOT the best predictor of oil stability and suitability for cooking at domestic temperatures. Results showed that EVOO performed best when compared with other common cooking oils. After heating EVOO contained only trace levels of trans fats, retained a high level of antioxidants and had a better fatty acid profile compared with all other cooking oils tested. These positive results for EVOO were achieved despite using temperatures and cooking times above those commonly used in domestic kitchens. It showed that the best predictors of an oil's stability and safety when cooking are the oxidative stability, the amount of poly-unsaturated fatty acids (PUFA) (more prone to oxidation than mono-unsaturated fatty acids (MUFA)) and saturated fatty acids, the natural content of antioxidants, and the level of refining that has occurred in the oil production process. De Alzaa F, Guillaume C, Ravetti L. Evaluation of Chemical and Physical Changes in Different Commercial Oils during Heating. Acta Scientific. 2018;2(6):2-11.